Beautiful handmade in the USA, curved bookshelf...Built of 3/4" oak plywood with a stain and black lacquer finish. This piece is original and will compliment any room. Features an edge routed, solid oak top. Stain shown is red oak, but different stain shades can be specified. The black lacquer sides are applied in several coats and hand polish between applications. 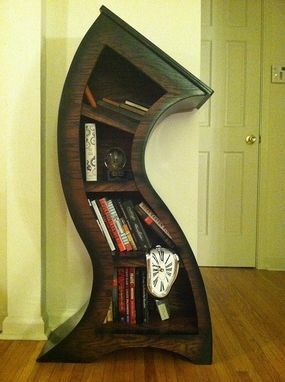 I absolutely love this shelf! It is excellent quality and is such an interesting piece. I have a feeling it's going to be a great conversation starter in my home! Amazing piece of artwork! I am putting this in my son's nursery. It's a Dr. Seuss theme. Thought this piece was fitting. Woodcurve was great to work with! Love love love this piece!! !